Airship Ventures: Red Letter Day. Two years ago, on April 19 2007, Airship Ventures was incorporated. Not something we reported on the blog then, it was merely an administrative task completed. But yesterday it took on a special significance. 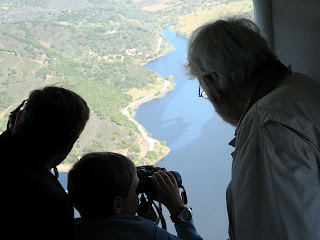 Brian and I decided to join the airship for its flight to Monterey and back and we were very lucky to be with our 'transit' passengers - mom, dad, son and grandson on a day outing for dad's birthday. It was a gorgeous day after the fog cleared, with a temperature inversion which gave us cool ground conditions and air at 1500ft as warm as a hand dryer. The fog was teasing the coastline all day, creating a spectacular glory around the shadow of the airship. For both of us, this flight was proof positive of how amazing the Zeppelin experience is. We felt honored to be able to peep as three generations sat on the rear window seat and discussed the world around them - the nursery gardens in Salinas, the IBM Almaden Research plant, the Lick Observatory on the top of the hills, the oil derrick pumping the shales, the waves breaking in the Monterey bay, the traffic on the road..... Their enthusiasm and joy was totally infectious and my face ached with smiling as I contemplated how the last two years of hard work had now enabled such treasured memories. Flying to Monterey by airship, spending the day at the world renowned Monterey Bay Aquarium and then traveling back in leisurely style at the end of the day has to be one of the most awesome opportunities we offer. The birthday boy said "Don't wait until you are 71 to do this. It's one of the best days of my life." We're glad to have been able to share in it.